President Donald Trump traveled to Long Island for the second time in less than a year to hold a roundtable on the brutal MS-13 or Mara Salvatrucha gang whose members Trump recently referred to as "animals." "We're here today to discuss the menace of MS-13, a ruthless gang that has violated our borders and transformed our once peaceful neighborhoods into blood-stained fields," Trump said. White House deputy press secretary Hogan Gidley said the goal of the roundtable was to address "immigration loopholes that enable MS-13 to infiltrate our communities." Trump said he plans to cut foreign aid to countries that allow gang members to enter the United States. “We are working on a plan to deduct a lot of the aid. We are going to deduct a rather large amount of money from what we give them. They don’t want the people we are getting in their country,” Trump said. "Despite all of the reports I hear I don't believe they're helping us one bit." Trump acknowledged the parents of two teenage girls, Nisa Mickens and Kayla Cuevas, who were brutally killed in September 2016 by MS-13. The parents, Evelyn Rodriguez and Freddy Cuevas and Elizabeth Alvarado and Robert Mickens, were also the guests of first lady Melania Trump at Trump's State of the Union Address. 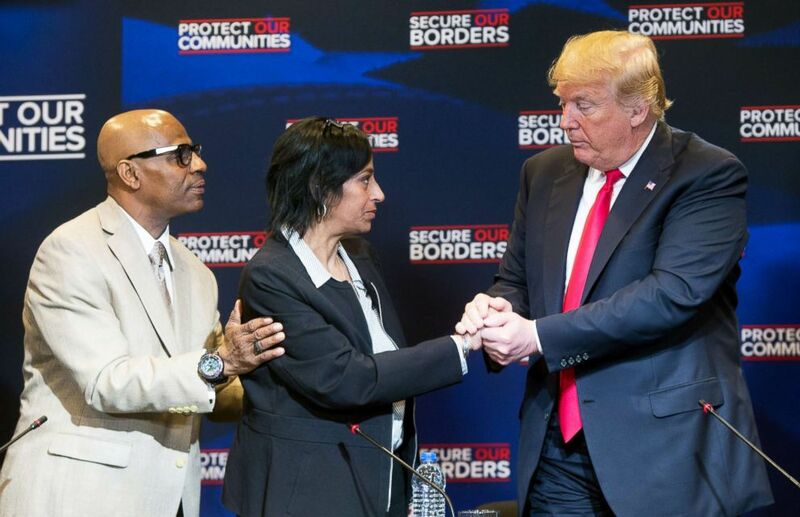 President Donald Trump embraces Evelyn Rodriguez whose daughter was killed by MS-13 gang members, alongside her husband Freddy Cuevas, during a roundtable discussion on immigration in Bethpage, New York, May 23, 2018. MS-13 has been on Long Island, where Trump spoke, for decades but now it is the largest gang on the island with an estimated 2,000 members. Between 2016 and 2018, police suspect MS-13 played a role in at least 25 killings on Long Island. Trump often conflates the gruesome and heinous crimes of MS-13 with border control and immigration policies, claiming lax immigration laws allow gang members to cross into the United States. And while MS-13 currently has its roots in Central America, the gang actually began in Los Angeles in the 1980s. Currently, it is estimated to have around 30,000 members in the world, and, according to the FBI, more than 10,000 in the United States, a number that has remained constant since 2006. Many MS-13 members living in the U.S. have immigrated from El Salvador and Central American countries, but most are legal U.S. citizens. Homeland Security Secretary Kirstjen Nielsen said seven of the 13 gang members who murdered Mickens and Cuevas were unaccompanied alien children who came into the country. According to June 2017 congressional testimony from the then-acting Customs and Border Patrol chief Kevin McAleenan, between 2012 and 2016, "of the approximately 5,000 individuals apprehended by USBP with confirmed or suspected gang affiliations since FY 2012, 159 were (UACs) unaccompanied alien children. Of those 159, approximately 56 UACs were suspected or confirmed to be affiliated with MS-13." On average the U.S. saw about 41,000 children crossing alone per year during that time period. Many are targeted for gang recruitment once living in the U.S.
Trump recently came under fire for calling people in the MS-13 gangs "animals." In response, House Minority Leader Nancy Pelosi said "calling people animals is not a good thing." “I called them animals the other day and I was met with rebuke," Trump said. "They're not people, these are animals, and we have to be very, very tough." Thomas Homan, Acting ICE Director, defended Trump's comment and said was being "kind" by calling MS-13 members animals. "Animals kill for survival and MS-13 kills for sport," Homan said. Trump was also joined by Deputy Attorney General Rod Rosenstein who has recently been targeted by Trump. Rosenstein and Trump shook hands before the program began. "I feel totally confident that this problem will be eradicated," Trump said. Later Wednesday, Trump travels to New York City for a fundraiser.